Here in Oregon, we are fortunate to have a wealth of supported bike events to choose from every year. Starting in February with the whimsical Worst Day of the Year Ride and continuing into October, the array of events is astonishing. But which rides are the best? We decided to leave that decision up to the people who know best: those of you following the course arrows and enjoying finish line beers. 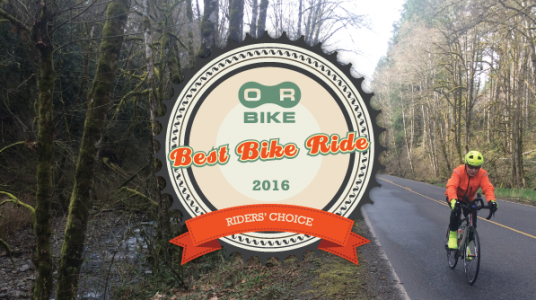 ORbike is the region’s only resource solely dedicated to promoting bike events and helping people find their next bike adventure. Since 2005, we’ve maintained a statewide calendar of supported events and have helped you select the very best. This past fall, we asked you to vote for your favorites, and here are the exciting results. Proof that size doesn’t matter. This gorgeous ride snakes through the forested region of the Southern Oregon Coast Range, stationed out of the little-known town of Powers, Oregon. The volunteer-run event pours gushing waterfalls of heart and soul into this beloved ride every year. In 2016 Cycle Oregon traversed a portion of the course: a 15 mile climb to Bear Creek with nearly 5,000 feet of elevation gain – gorgeous, and grueling. But Tour de Fronds also offers alternate routes that aren’t as intense, with five options featuring pavement or gravel, hilly or flatter. With a ridership hovering just around 200, we were astounded to see little Tour de Fronds snag first place by a landslide: 23% of the votes. Tour de Fronds happens every June. The 2017 event is scheduled for June 17. Out of the gate strong! This brand new ride takes riders on a serene tour of the old logging towns around St. Helens, Clatskanine, Scappoose, Apiary, Mist, Rainier and Vernonia – incredible areas where no other supported rides travel. There are two route options, including a killer optional 12-mile stretch of hard-pack gravel along the Historic Crown Zellerbach Linear Trail. It’s not easy to start a new ride, but the organizers of the Columbia Century Challenge worked diligently to ensure theirs went off without a hitch. Columbia Century Challenge happens every June. And now here’s the difficult news: the 2017 date is exactly the same as Tour de Fronds. A fall tradition. As we pedal away from sunny rides into the shorter, colder and wetter days of fall, Harvest Century is our annual ceremony to ease into the next season. This splendid ride offers somewhat of a recap of the season. It traverses portions of many other rides, including Pioneer Century, Tour de Cure, Portland Century and CF: Cycle for Life as it snakes through Washington County into wine country and across the Canby Ferry. This incredibly well operated event is a fundraiser for Community Vision, an organization that helps people with disabilities lead rewarding lives with independence. Harvest Century is every September. The 2017 event is September 24. An intimate adventure. This all-inclusive experience includes eight days of riding and full support every step of the way. The ride is well known for the small, intimate atmosphere where all riders are close friends by the end, and everyone goes home with new riding buddies. With delicious food, nighttime bonfires and sweeping coastal views, it’s no wonder Arthritis Bike Classic gets rave reviews. This year’s event featured all new routes, and clearly the riders loved them. Arthritis Bike Classic is every September. The 2017 dates have not yet been set, but the event will likely take place the third week in September. Fifth Place: A tie. Ride to Defeat ALS and Art of Survival Century. These two excellent rides both earned exactly 53 votes. * Ride to Defeat ALS takes rides on a lovely tour of the Willamette Valley as it ventures through the farmland around Mt. Angle. The ride is a benefit for the ALS Association of Oregon and Washington, which provides impressive and extensive services to people living with ALS and the families who support them. Ride to Defeat ALS happens every July. The 2017 event is July 8. * The Art of Survival Century is a very special experience, so it’s no wonder you selected it as a top ride. The event takes place on the border of Oregon and California, staged out of the tiny town of Tulelake, CA. The town was once home to one of the most tumultuous Japanese internment camps, a blight on the region that many feel still burdens them to this day. The Art of Survival Century is part of Tulelake’s efforts to bring economic vitality and positivity to the region. Because the ride is in such a remote setting, just outside of Klamath Falls, it makes for an awesome weekend adventure of exploring other parts of our fine state. Rural – very rural – and surprisingly bike friendly. Drivers give cyclist a wide birth, though they rarely even pass by on the quite farm roads. Art of Survival Century is a quiet, introspective adventure like no other. We love this ride and are so pleased to see our readers and fans agree! Art of Survival Century happens every Memorial Day Weekend. The 2017 event is May 27. We would like to send a huge thank you out to all of the region’s hard-working event organizers who put on fantastic rides for us to enjoy. These supported events get more people riding and smiling, and are an incredible way to explore the state of Oregon. We can’t wait to see what you have planned for 2017! Now accepting applications for strong riders to pull me up the hills of the Columba Cycling Challenge! Over 6,500ft of ’em over more than 119 miles on route…. Come take the 2nd Annual Challenge! You’ve been dared.